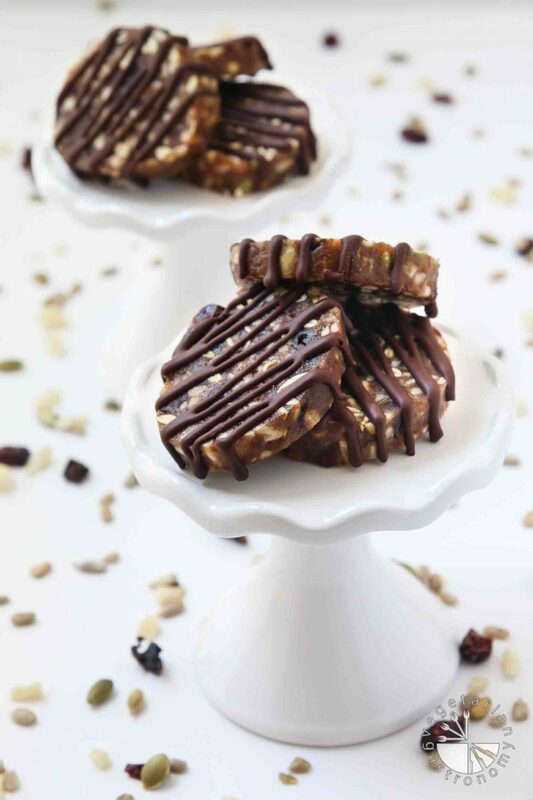 These hearty no-bake chewy chocolate date cookies are packed with wholesome dried fruits and seeds, making them the perfect natural energy booster! With the end of the school year approaching fast, and Summer right around the corner, things are busy as ever in our home. I have a feeling it will be that way through the end of August. With two active little kids in the mix, I’m always looking for new healthy snacks in between meals, that will keep them going throughout the day. And let’s be honest…we adults sometimes need these energy pick-me-ups more than the kids do, ha! Our typical quick go-to is a green smooth consisting of non-dairy milk, fresh spinach, fruit, and a nut or seed butter. Or when I’m really short on time, I grab some relatively clean store-bought bar that we keep in the pantry. Another favorite snack for my kids are dates, typically stuffed with a nut or seed butter. If you recall from one of my previous posts, I talked about how dates are part of our family and how I get my supply of dates from my in-laws’ backyard. Yes…how amazing is that! I’m so fortunate that they have date palms and grow more than a thousand dates every year; large, delicious, Medjool Dates. Dates stay nice and fresh when stored in the freezer, so I typically have an endless supply of them at my disposal. Dates are a great natural energy boost and a good source of various vitamins, minerals, natural sugar, and fiber. But as we all know, stuffing dates with nut or seed butters always leaves us with sticky fingers and mouths. So I was looking to change it up and create something with dates that was mess free, easy to make, ready-to-go, healthy, and tasted dessert-like. Growing up, I recall making date-nut rolls with my mom, especially when we went on travel. 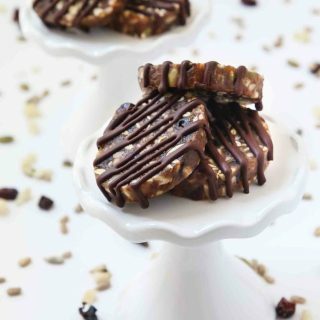 But since my son isn’t a huge fan of large pieces of nuts, my daughter’s school is nut-free, my brother has Celiac, and we have a lot of close friends with other food allergies, I partnered up with one of my favorite brands, Enjoy Life Foods, to create these vegan allergen-friendly No-Bake Chewy Chocolate Date Cookies! If you don’t know already, I’m the BIGGEST fan of Enjoy Life. I first discovered them about 4 years ago while trying to find good allergen-friendly vegan dark chocolate chips to use for all my baking and dark chocolate addictions. I call myself a chocolate snob and was worried I wouldn’t find a good vegan replacement, so when I came across Enjoy Life, I was so relieved. Not only do I love the taste of their chocolate chips, but they are an awesome brand that makes great quality, allergen-free products. Their products have become a staple in my pantry, and their mini chips snack packs travel with me everywhere! These No-Bake Chewy Chocolate Date Cookies are free of the top 8 common allergens including all nuts, gluten, dairy, eggs, and soy. They take about 15 minutes to prep with the use of Enjoy Life nut-free Beach Bash seed & dried fruit mix and their dark chocolate bars/chips. The key to this date cookie recipe is getting the right consistency. They can be stored in the fridge for a long time and make the perfect delicious grab-and-go breakfast or afternoon snack if you need a quick energy boost. They also make for a great pre-workout snack or healthy post-workout option. To say my kids love them is an understatement, and when healthy snacks double up as dessert, it’s a win-win for me! So skip the energy bar and change it up with one of these mess-free No-Bake Chewy Chocolate Date Cookies instead! You can even turn it into a fun activity to do with your kids! If you do, don’t forget to tag me on Instagram or Facebook, both @vegetariangastronomy #vegetariangastronomy ! I’ve loved seeing and sharing all of your re-makes! Pit the Medjool Dates and process in a food processor until all the dates are finely chopped, mostly blended, and sticky (small chunks remaining are ok). You may need to stop and scrape down the sides a few times in between. Take out the date mixture into a microwave save bowl. If there are still large pieces of dates remaining, take a masher or fork and quickly mash them down. Add the vanilla extract and 1/4 teasp non-dairy butter. Microwave for 40-60 seconds, covered (depending on how powerful your microwave is, time may vary). Remove, mix, and mash once more with masher or fork. Microwave again for 40-60 seconds, covered. 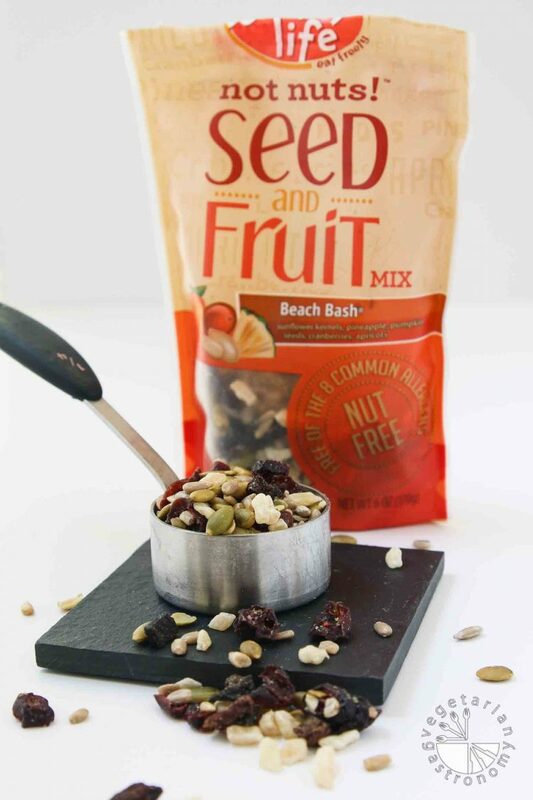 Remove from the microwave, add in the Enjoy Life Beach Bash Seed & Dried Fruit Mix and combine completely with a spoon. At this point, the date-seed mixture should be form-able and not that sticky. Coat your hands with a tiny amount of non-dairy butter or oil. Take the entire date-seed mixture into your hands. Roll it into a large sphere and then shape it into a 2-2.5" diameter cylinder by gently rolling it on a flat surface such as a cutting board. Place it in an air-tight container (or cover completely) in the fridge for about 5 hours. Melt the Enjoy Life chocolate chips or bar pieces in the microwave in 20-30 sec. increments (mixing in between) or use a double broiler (I prefer a double broiler). Once the chocolate is melted, take the date cookie rounds out of the fridge. I placed them on my cooling rack so that the chocolate drizzle could drop off, but you can just as easily use a tray lined with parchment paper. Fill a ziplock bag or pipping bag with the melted chocolate. Cut a tiny corner off the ziplock bag if using. 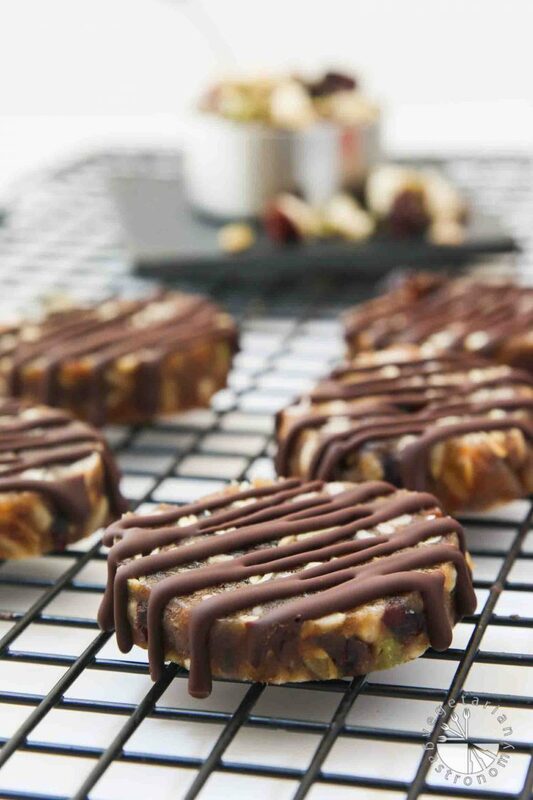 One by one, drizzle some melted chocolate on top of each date cookie. Place the chocolate date cookies back in the fridge for a few minutes until the chocolate hardens. Enjoy the chocolate date cookies immediately and store any leftovers in an air-tight container in the fridge for 1-2 weeks! After placing the date-seed log in the fridge for 5 hours, the date cookies should slice easily and hold shape. If you find that the date-seed mixture is still sticky and does not hold shape well, then the dates used were either too soft or the mixture was not microwaved enough. They will still taste good, but will be softer and chewier than intended and may not hold the cookie shape. To melt the chocolate, I prefer using the double broiler method. 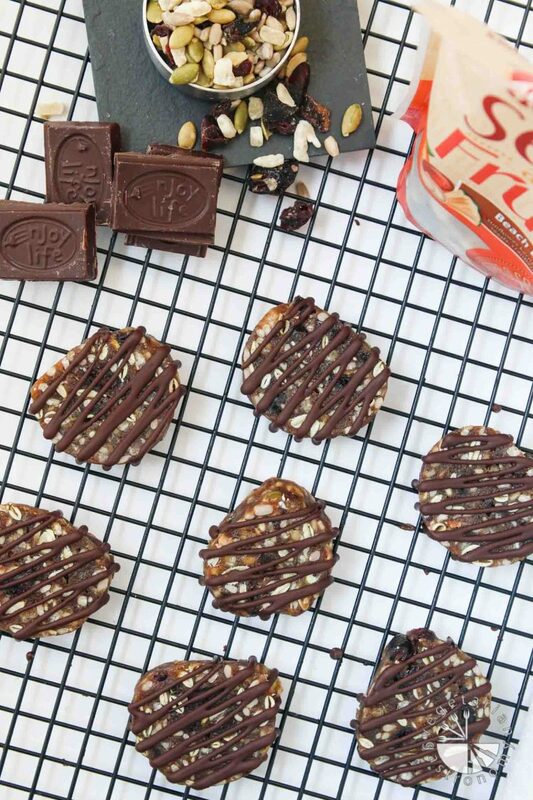 Instead of using a pipping bag to drizzle the chocolate on top of each date cookie, you can use a spoon to drizzle or spread a thin layer of the melted chocolate on top. This post was sponsored by Enjoy Life Foods, but the opinions and text are fully my own. OMIGOSH - this is just perfect in every possible way. No bake and healthy, I actually have a packet of dates sitting in my freezer as we speak, I am definitely going to be making these :-) I just don't get the 'Enjoy Life' brand here, could I substitute any fruit and seed mix with the chocolate chips too?Also those miniature cake stands are to die for! I love them!!! You presentation is soooo on point and your pictures.... NO WORDS! Wow! I love this recipe.. sounds so easy to make and so healthy... definitely a win win :) I must agree, your pictures are always Picture Perfect and you always know exactly how to display all your creations! Hope your side is getting nice and warm while we slowly move into our Winter season.. Brrrrr... its cold today! Thanks Natalie!! The roll-a-giant-log-and-slice method is definitely awesome! But I can't get credit for that one...it was what I used to do with my mom growing up :) It also requires you to get the consistency of the date mixture right so that it's not too sticky, but it works like a charm! These definitely did not stay long in my house. In fact, the kids were quite disappointed that there were no more. I have a feeling we'll be stalking these regularly in our fridge over the next few months ha! My son isn't a huge fan of pieces of nuts/seeds, so the enjoylife drizzle definitely makes it appealing even to those that are picky eaters! 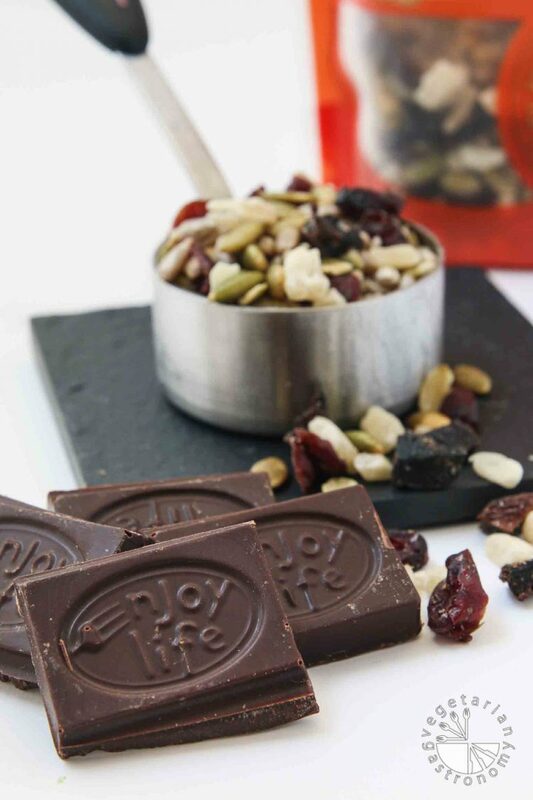 Even I'd devour anything with enjoylife chocolate in it ha! The leftover snack mixes and chocolate made the perfect travel food when we went to sedona! And I really do carry packets of their mini snack size bags with me everywhere ha! Thanks so much Natalie!! They look just perfect for an afternoon snack at work!Packed with energy, but healthy and chocolate-y! Thanks for sharing this recipe! Exactly what I was going for Linda! Thanks!! It's so hard to stay away from them when they're in the fridge ha! When I see the words chewy and chocolate...I'm all in! Wow, no-bake AND healthy? Talk about a winning recipe! They look amazing! I had to think when you said school is almost over but I guess it is! You are very lucky to have in laws with date trees! They are pretty expensive here! Thanks Beth! I know I can't believe the year is almost over!! I consider myself quite lucky about having the fresh dates. I love their yard in the dessert! Thanks Nicole! Exactly why I love them so much, especially after going vegan, their products are awesome and make baking so much easier! These sound really good. I haven't really experimented much with dates but it's something I think I need to explore. Dates are so awesome for so many things! This is a great recipe to start off with! They last a long time in the fridge, you say? I think you're being a bit hopeful there. If my kids didn't demolish them sharpish then I certainly would. This is an ideal recipe for kids to make too - baking with plenty of healthy ingredients has to be a good thing. Haha...you are absolutely right! I actually demolished the entire first batch myself without sharing or telling my kids I had them haha! Thanks Lucy! Hopefully you get a chance to make them! Love healthy snacks that double up as treats! Dates are very handy when there is no bake recipes. Your recipe and picture is very good Anjali :) This is actually mouthwatering cookies. Date and nuts ! Easy no bake. We love it.